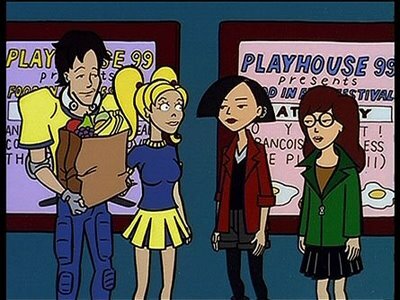 Remember the dumb jock Kevin in Daria? He may not have been so dumb if he did yoga! We have all heard the term dumb jock. A dumb jock is a meat head, muscle head, fine tuned athletic machine but not necessarily someone you think uses their brain. Your brain had to signal to your right arm to move the mouse. Then you must create the precise pressure against the mouse to scroll to the address bar. To type the URL your brain had to send separate signals to each finger for every letter you typed. This is obviously not ground breaking, but think about how simple that task is. Those are the simplified steps to reaching the end result of reading this post but it still required 3 steps. Now think about something as complicated as doing a layup, a simple move in basketball. You have to send hundreds of signals to the lower body to coordinate running and jumping while moving towards a target. Another 100+ signals are sent to your hands to dribble the ball, pick it up, use strength in your finger tips to palm the ball, and, finally, precise muscle control to send the ball in the right direction towards the hoop. While both sets of signals occur there are also 100s of signals activating your shoulders to move, bringing your arm over your head so your fingers have a line of trajectory into the basket. ….I could go on and on about the amount of neural conductivity it takes to do one action, but I think you get the point. Any movement of the body requires an intense amount of brain power. As we perfect a skill, most of this happens subconsciously. However, if you can learn to have finer control over these movements you ultimately become a more skilled athlete. This is where yoga for athletes comes in. Yoga helps better tune mind-body connection. In other words, yoga enhances the way you create motion. With yoga you can train yourself to become more aware of the physical actions you perform. Tony may be a strong football player, but he could be stronger when he learns to lock his knee and transfer his body weight into the ball of his foot! Think about the pose Dandayamana Janushirasana. Locking your knee doesn’t mean have a straight leg. It means contracting every single muscle fiber in your standing leg for 60 seconds so that you can stay stable while still controlling and moving other parks of your body. Even the strongest athletes struggle with this pose when they first start yoga. They will argue they aren’t flexible enough to do the pose, but what they don’t understand is that they are doing the pose wrong before they ever get started. The purpose of the pose isn’t to kick your leg out and touch your forehead to you knee. The purpose is to have the strength to keep every fiber in your quadriceps contracted. It takes hundreds to thousands of attempts to train your body to do this. After many attempts of trying, you would be more stable if you could just make the smaller muscles that make up your toes apply pressure to the ground. That is the first step. Then you begin to strengthen those muscles because you have become aware of them. When you become aware of the “smaller fine motor control muscles” you start to realize how much they can help you in your sport. A soccer player will begin to feel the push off to change direction all the way through their little pinky toe, allowing them to cut sharper and faster! The basketball player will no longer just jump up for a layup, but extend through their big toe fully contracting their calf muscle more than before adding inches to their vertical! The volleyball player will not only know they need to snap their hand on their follow through hitting a volleyball, but begin to feel their brachioradialis, flexor carpi radialis, and flexor carpr ulnaris contract. Yoga isn’t just about stretching tight muscles athletes use over and over. Yoga can be a medium to develop finer control over your body, making you a better athlete in your sport. Yoga will train your mind body connection. The athlete you strive to be isn’t such a dumb jock after all!